There are many beautiful and thoughtful entries in the Make it for Mom Challenge that we wanted to add a few more awards. Here are the runner up designs voted by you! We’re sending each of them a special gift bag. Congratulations ladies! This is an inspired design by my mother.This necklace evokes the ethereal sky.- very richly Feminine design -By reflects colors: blue- freedom, neatness- white, red- passion. Read more about Bea’s entry here. Read more about Albina’s entry here. This is a necklace, made for my Mother-in-Law. 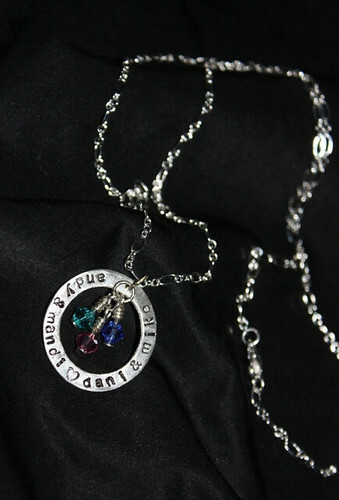 It features the names of her son & daughter and their spouses, along with the Swarovski birthstone to commemorate each or our birth months. (My husband and I share December birthdays, so only 1 December stone was used.) This is a fun, delicate & dainty way to showcase her most prized “possessions” — her children! Read more about Mandi’s entry here. My mom stays in India. I miss her and I will miss her specially in Mother’s day. I made this nice jewelry set and I sent it to her. She was very happy and emotional to see this and it is very special to her. She loves this design. I have seen my mom make jewelry and different craft work when I was little. 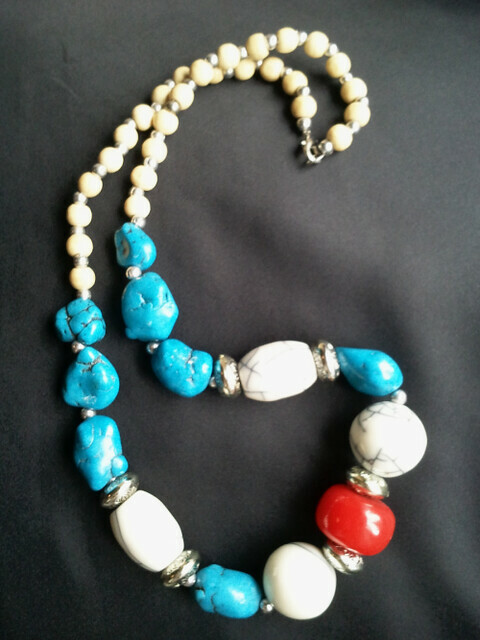 She used to make varieties of clay beads and crafted different design on them. Sometimes she use to use glass edge,bowl edge, small piece of wire to make disign. She did not have specific tools to make such kind of things. She is very expert at it. My mom likes crystal jewelry and she likes jhumka too. So I just join these two concepts together. Read more about Monalisa’s entry here. This design is inspired by someone that is like a mom to me. The courage that she exhibited through her personal battle against cancer and through her routine follow-ups is remarkable. 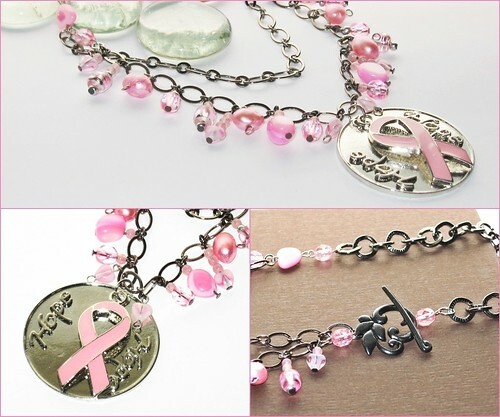 The name of this piece is called Hope Eternal – because until there is a cure, we all hold on to HOPE! Read more about Dawn’s entry here. Don’t forget to see Irina Wilson, the grand prize winner, entry in the Learning Center. Check out the rest of the entries on the Make it for Mom Challenge entries page! Thanks so much for sharing my design as a runner up. I feel so blessed to be among such talented designers! Everybody’s work is stunning! I like the mix of chunky with smooth. A very substantial necklace (necklace #1).